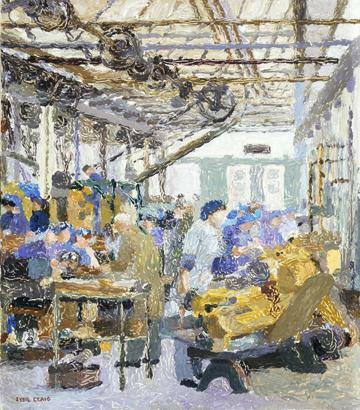 Craig's colourful and impressionistic work captures the activity of women operating electric lathes to perform single tasks on 18- or 25-pounder shells before these are passed on to the next operator. With the escalation of the war and much of the male workforce away fighting, women replaced men in the factories. As process workers they were trained for specific operations that were often dangerous and onerous. To protect them from the machines and the dirt they wore overalls and snoods over their hair.